Since its inception, Boddwyn Alpacas has employed Tim Purcell (Adv Dip CALM) to look after the herd. 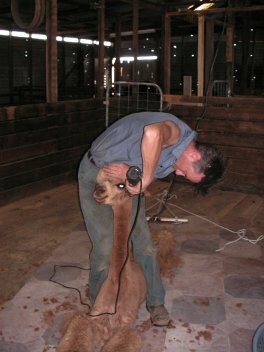 Tim also operates his own shearing service. He will shear any number of alpacas anywhere with price subject to the number of animals and the distance travelled. Tim can contacted on 0418 320 655. He can be very busy in October and November so it is best to book early. This way he can arrange to shear a number of animals in your area on the same day reducing the travel costs. There needs to be someone present who is able enough to assist Tim to tie up the alpacas. No experience is needed, just average strength and a willingness to learn. If possible, shed the animals overnight without food or water. Make sure that you have plenty of rags, and bags in which to put the fleece. Fleece bags can be obtained from Australian Alpaca Fleece Limited http://www.aafl.com.au/ who will post them to you. If you are shearing more than two animals it is worth obtaining a copy of the Fleece Handling and Information Booklet which can be downloaded at http://www.aafl.com.au/docs/growers/fleece_handling_information_v4.pdf.